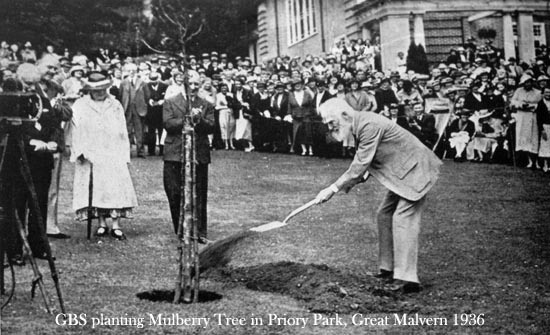 During the Malvern Festival of 1936, George Bernard Shaw planted a mulberry tree in Priory Park to commemorate his 80thbirthday. At the planting ceremony he said that he hoped the tree would outlive him. Shaw died in 1950 aged 94 years and the tree was blown over in a storm during the winter of the year 2000, aged just 66. The memorial to Shaw was thus lost forever, or so it was assumed. Dreadful storms had completely uprooted the tree and within hours Council workmen had sawn it into pieces. One huge slice of trunk was rescued and donated by Bruce Osborne and Cora Weaver to Malvern Museum as a reminder of Malvern's theatrical heritage. The growth rings faithfully record the history of the tree and its passage through such epics as World War II. 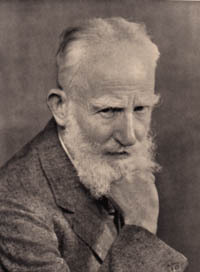 Picture left - George Bernard Shaw in 1934. 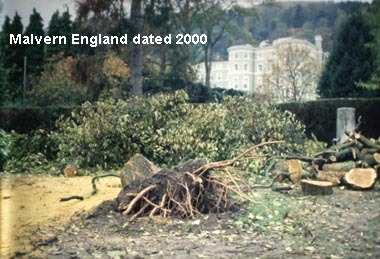 Research by Friends of Malvern Springs and Wells however revealed that in 1959 a cutting from the original tree was sent to Malvern in Victoria, Australia. It arrived in a poorly state but further investigation identified where the cutting was planted - and that it is now a massive, healthy tree which continues to thrive. 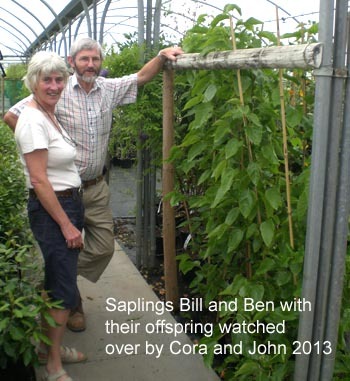 A project was launched by the Friends of Malvern Springs and Wells to return a cutting to Great Malvern, England, made possible with the sponsorship of Coca-Cola then bottlers of Malvern Water from the Malvern Hills, and the City of Stonnington, Australia. Via Heathrow, six healthy cuttings arrived in Malvern, Worcestershire from Malvern, Australia on Friday 14 August 2009. One of the tasks has been to identify a potential site in Malvern for the best sapling after the saplings have grown to a suitable size in secret locations. Top choice is the original location in Priory Park adjacent to the Priory Park Spring and water garden, one of Malvern's famous springs and wells. 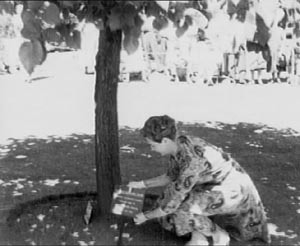 When George Bernard Shaw planted the first generation Mulberry Tree in Priory Park alongside the Mulberry Spring in 1936, he used a spade that appears in several photographs. We have been seeking a similar famous spade for the replanting. As a result of her research, Cora learned that a spade known as the 'Elgar Spade' survived. The composer had planted a mulberry tree at Battenhall in Worcester in March 1931 with it. Shaw and Elgar were friends. Cora secured this spade for Friends of Malvern Springs and Wells who then donated it to Malvern Museum. 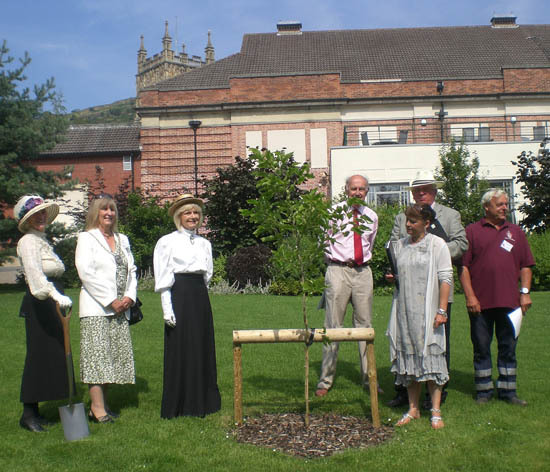 So, when the time came it was the Elgar Spade which was used when the Friends of Malvern Springs & Wells unveiled the third generation Shaw Mulberry Tree in Priory Park. The six original cuttings all survived. The largest by 2013 was about 8 feet tall and the anticipated growth they achieved in 2013 suggested that they were ready for transplanting. The best two trees went to Priory Park, Malvern, to establish themselves before the planned unveiling. 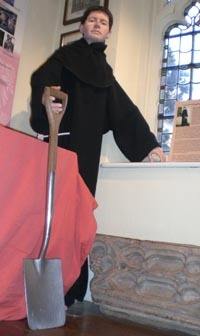 Picture right - the Elgar spade in Malvern Museum used for the unveiling. 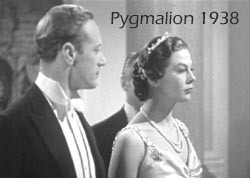 Wendy Hiller the actress stars in Shaw's play Pygmalion, later to be turned into a movie My Fair Lady. In the 1950s. she later went on to unveil a plaque to Shaw at the Mulberry Tree in Priory Park, Great Malvern. 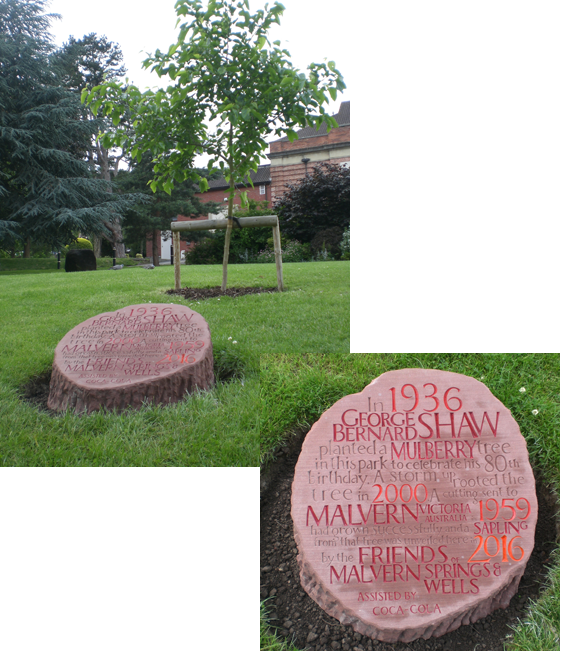 The new George Bernard Shaw Mulberry tree was unveiled in Priory Park at midday on Saturday 25th June, by Australian ambassador Di Foster. At 10.30 there was the opening of Malvern Civic Week ceremony and procession from Belle Vue Terrace. This was followed at noon by the unveiling of the Mulberry Tree plaque and tree in Priory Park. Those attending received a free ticket for refreshments reception and free entry to Malvern Museum that afternoon where a special display of Malverns Worldwide and George Bernard Shaw had been mounted. At 1.00 the Mulberry Pie and tea/coffee reception was hosted by the Mount Pleasant Hotel. Later that day at 7.00 pm at the Mount Pleasant Hotel - an evening hot and cold buffet meal followed by presentations etc. Di Foster presented on Malvern Australia and Myfanwy Fox read her Mulberry Sonnet. The stunning plaque, resembling the fallen original tree, was created by Catherine James, a local stone mason. The unveiling ceremony was attended by a large crowd including visitors from Malvern (Vic.) Australia and 93 year old Joan Fowler who attended Shaw's original unveiling in 1936. A special souvenir book - Two Malverns and a Mulberry Tree was published for the occasion as a limited edition of 100 only. A few only are still available at six pounds each including postage from Cora Weaver of Friends of Malvern Springs and Wells, 4 Hall Green, Malvern. Worcestershire, WR14 3QX. United Kingdom. Written for the unveiling 2016. Common threads run through lives, through history. or prosaic language dancing into rhyme. of granite quarried from the Malvern Hills. sure, wind their silk, but let them fly, full grown. 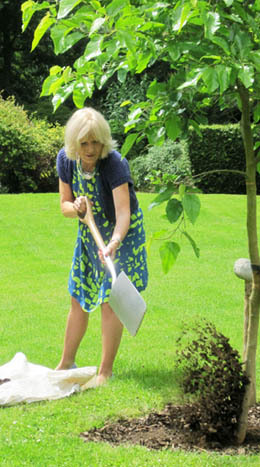 Picture above - Di Foster ambassador from Malvern, Victoria, Australia shovels five spadesful of earth on the Mulberry Tree in Priory Park as the symbolic planting using the Elgar Spade now in Malvern Museum. 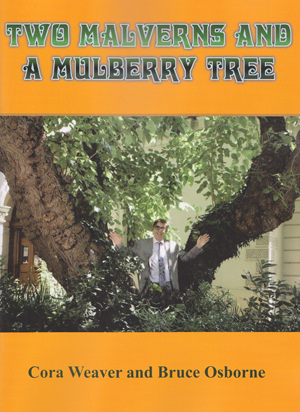 The earliest Mulberry Tree in Croydon - The East India Company Military Seminary was a British military academy at Addiscombe, Surrey, in what is now the London Borough of Croydon. Addiscombe House in Mulberry Lane was the principal building of the seminary. Its garden contained the stump of a Mulberry tree - reputedly the first ever imported into England by Peter the Great who stayed here. The tree gave the name to Mulberry Lane. The East India Company came to an end with the Indian Mutiny of 1857, and Addiscombe House was dynamited shortly after. To find out more about Addiscombe House click on the tree vandal right. SEE THE PROGRESS REPORTS BELOW for details of how the saplings progressed and the many people involved in bringing the project to fruition. In Australia Anne and Neil Thomas set out to find the Mulberry Tree sent from England as a cutting from Shaw's tree in Priory Park. 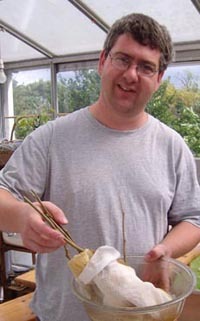 Oliver Weaver from Malvern England arranges the importation of the cuttings from Malvern Australia. 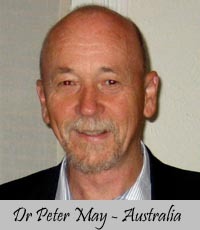 Peter May in Daylesford AU organised the taking and rearing of 6 cuttings from the Australian tree. The cuttings are reared in a number of secret locations. 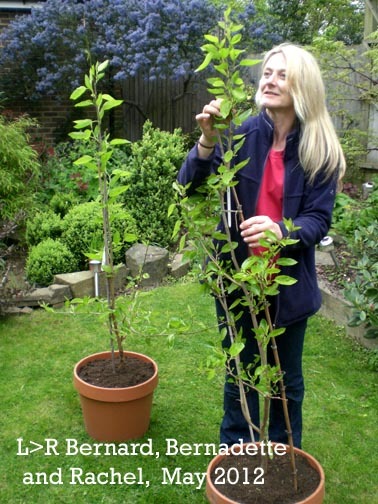 Rachel in Surrey was able to nurse several cuttings into prolific growth. Other cuttings were reared in Colwall nurseries. Below - A thriving sapling is planted in Priory Park awaiting formal unveiling. 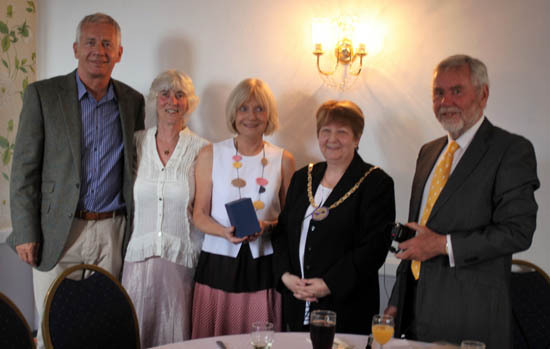 Below - Dignitaries gather after the 2016 unveiling to exchange gifts between Malvern AU and Great Malvern UK. This whole project would not have been possible without the assistance of Coca-Cola who are former bottlers of Malvern Waters. Following the unveiling in 2016 and the liaison over many years with Malvern, Melbourne, Australia, it was decided to launch the Malverns Worldwide project. For details click on Malverns Worldwide below. Click Website below to go to Malvern Melbourne Australia.